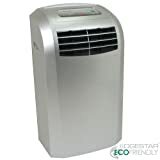 The Koldfront AP12000S-KF (formerly the Edgestar AP12000S) is a 12,000 BTU rated portable air conditioner that is capable of effectively cooling up to 425 sq.ft. of enclosed space. The unit includes an air vent hose and window kit that expands out to a generous 55” maximum. The AP12000S-KF offers features such as a 12hr programmable timer, dehumidifier function (90 pints per day), 3 fan speeds, digital thermostat control with a 61F to 89F setting range, remote control and caster wheels. The unit includes a washable pre-filter and one replaceable carbon filter to help control odors and pollutants. The unit features an internal condensate removal system that will handle all but the most humid environments saving you the trouble of manually emptying a water bucket. The AP-12000S-KF meets new RoHS standards that restrict the amount of certain toxins in electronic and electrical equipment. Furthermore, it also uses R-410A refrigerant for cooling, which does not contribute to ozone depletion.